Venus Flytraps near my Grandparent’s home in coastal North Carolina were the first plants that caught my interest. Like many kids, I was fascinated by the idea of carnivorous plants, but until reading an article in National Geographic, I had no idea that they lived so close to a place I visited frequently. I begged my parents repeatedly to take me to the Green Swamp to see them, but in vain. It wasn’t until college that I was finally able to search on my own. By that time, I’d learned that not only were there carnivorous plants and bogs in NC, but also one county over in Augusta. Now I also quickly learned that botanists are really guarded about just telling you where things are, (and justifiably), so I had to do the research myself. In my case, I started in old plant journals like Claytonia, where people were once less careful about describing the locations of places. Reading these accounts of our landscape was like a journey back in time, and I delighted in hearing the accounts of these magical places. Several of these sites in particular really fascinated me. One was referred to as “Mountain Lake” and I realized it must have been one of the sinkhole ponds in Augusta County. Apparently when the orchids were blooming it was described as a “sea of pink”. 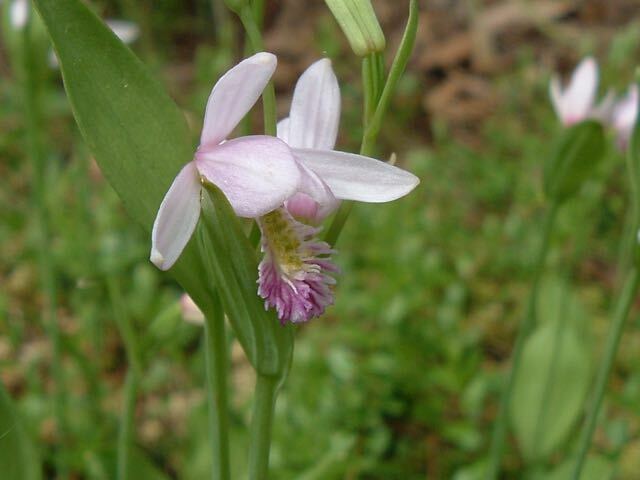 At that point, it was fairly recent news to me that such a thing as a native orchid was even a thing, and yet here was a place covered with them. After narrowing down the location, I began to have a sinking feeling . . . and indeed, there was a sinkhole pond, right in the area described. But it was now a resort called Shenandoah Acres. To confirm, I asked one of the owners who told me that it had once been a cranberry bog, so his grandfather dredged out all the plants and soil, covered it with sand, and installed water slides and sorts of other plastic kitsch, including a brightly colored dinosaur. Although the crime had been committed well before I was ever born, to me the heartbreak was immediate. Nonetheless, I was not deterred. I sought out another place I knew to exist nearby called Spring Pond, which reportedly had native orchids, sundews, and even pitcherplants (introduced). In this case, I was once again late to the scene of the crime. The forest service had scolded local botanists for breaching a beaver dam. But without the intervention of botanists, the entire site remained underwater for years, and when the waters finally subsided, there wasn’t a single rose pogonia, grass pink orchid, or sundew to be found. 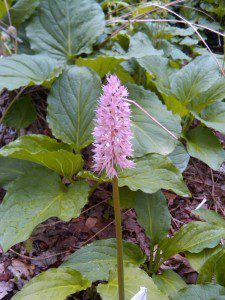 All the hundreds of rare swamp pinks (Helonias bullata) that once graced the site were gone. I was dumbstruck. Twice in a row, I’d finally tracked a place down only to find it destroyed before I could get there. Next I tracked down a place called Magnolia Swamp in Augusta county, known as one of the most diverse sites for orchids in the area, and also a location for native sundews. Natural Heritage staff described the site as a “Relict of a Relict,” a patch of coastal flora stranded in the mountains. Because this one was private property, I had to first track down the landowners and get permission to access the site. After meeting them, it was clear that while the site had been known for decades, not much had been done to educate the landowners about the treasure they possessed. In this case, a slow and steady decline had been eating away at the diversity of the site. It was being grazed by cattle, a mixed blessing , since the cows had taken the place of fire in suppressing vegetation and keeping the wetland open. 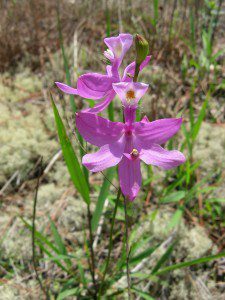 Nonetheless, once again, all key orchid species were gone, including the last confirmed site of dragon Mouth orchid in the whole state. To add insult to injury, a pond had been recently added, flooding a portion of the wetland. That said, many of the species described long ago still existed there; native flag iris, swamp rose, sweet bay magnolia, highbush blueberry, and many other beautiful species. Instead of Bald Cypress, on each raised mossy hummock there was a fragrant sweet bay magnolia, and then all around it in the water were skunk cabbage and marsh marigold. In the meadow portion, the iris was a sea of blue flowers in bloom. So at least I caught a significant glimpse of what a native fen could be, and maybe there was some hope that work could be done with the landowners to protect and restore the site. As I became more involved with other amateur botanists, I realized that they all had their own stories just like mine. Many of us became interested in conservation because of direct experiences with a lost place or species. It’s a story you hear over and over, with merely the names and the details changed; a story that usually ends in a shopping mall, subdivision or resort. At one point I learned about Poo Run Bog near Petersburg, one of the last really expansive colonies of yellow pitcherplant bogs in Virginia, where once pitcherplants extended as far as you could see. It was scraped clean of vegetation, even the soils were removed – as fill to make I-95. Now only a few tantalizing photos of the site are all that is left. I also learned about fights with the Forest Service to save the last Showy lady slipper in the state, only for the last site to be destroyed by a new forest road. The endangered Venus Flytrap in its native habitat. Eventually, I was able to track down more pristine sites that truly represent what a healthy mountain bog ecosystem could look like. 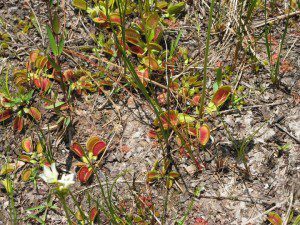 I even was able to make the trip to see Venus Flytraps in the wild in the longleaf pine savannahs of North Carolina. But I realized that if I loved plants, I had to be involved in their conservation. I could not simply sit passively by to let more sites disappear. I’d like to say that things have gotten better, and that I haven’t borne witness to the loss of more habitats, but the truth is that loss continues at an accelerated pace. When I look at any landscape now, part of me wonders what it was like before. Was there a beautiful wetland full of orchids? Did Carolina parakeets or passenger pigeons nest in those trees? I think it is our responsibility to help protect not only landscape we see, but also the landscape of memory, the places preserved in the historical accounts and the stories of our fellow botanists and naturalists. The world needs to know the scope of what we’ve lost, and even feel some of the loss themselves. In that way maybe we have some chance of saving what is left, or even restoring some of these places. I can say that now, in my position as a Director for the Soil and Water Conservation District, I work with landowners to fence cattle out of wetlands and create habitat. As Chair of the Albemarle County Natural Heritage Committee, I’ve even helped manage to get a few special places under permanent protection. My own conservation work will always be informed by my knowledge of what I could not save. It’s not much, but at least I am now part of the solution, and that’s a start. Thank you for sharing your memory of landscape and plants, Lonnie. The Swamp Pinks before beavers is one of elation and dejection since I saw the large blooming Hellonia bullata at Spring Pond ringing the pond while Golden Club bloomed densely in the center. Also, attended mitigation meeting about moving the beavers from that pond to another distant one. Too late for our generation ever seeing Spring Pond’s destroyed ecosystem. Another Virginia memory is Jake Kagey taking several of us to visit Showy Ladyslipper, Cypripedium reginae, a small family on a single small hummock in a “secret place.” Not exactly blind-folded to be led there, but not easily accessible. Thumping our walking sticks on the way to alert the rattlesnakes we were coming. Many of us privileged to see an unusual plant, next experience the natural feeling to admire it. Next, to fear for its survival and, finally want to protect it. Thankfully, you are doing these things through your work and I only wish there were many, many more of “you” to do that. Lonnie, I became very familiar with Spring Pond and its swamp pinks while working on that ranger district 1985-1997. There were many swamp pinks around the pond, especially where there was at that time a short boardwalk. We became concerned about the effect the beavers were having on the swamp pinks and trapped them out. We also removed enough of their dam to drain the water level back to “normal. This was probably around 1990, but it’s been a minute. I think we had to trap them a second time, and of course it would take annual monitoring to continue to remove any more beavers that would move into the neighborhood. Oh, and some time in the mid 1990s I was working in the area and found a good sized population of swamp pinks that weren’t previously mapped, as far as I knew. One of these days I need to get back up there and look around.